Vos takes fourth win at Italian one-dayer, and her first of 2019. Marianne Vos (CCC-Liv) took the draggy sprint at Trofeo Alfredo Binda, Sunday, opening her account for the season. She beat Amanda Spratt (Mitchelton-Scott) and Cecilie Uttrup Ludwig (Bigla) into second and third place respectively from a breakaway group of eight. 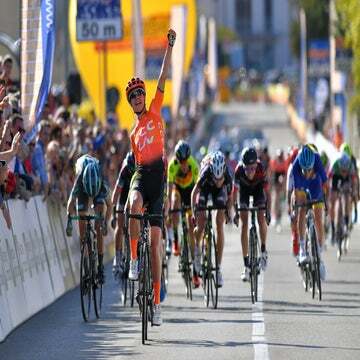 The 131-kilometer race from Taino to Cittiglio was peppered with hills, including one that falls in the finishing circuit, which was taken three times before the finish line. After all the early breakaway was caught and a brief attack from Jolanda Neff (Trek-Segafredo) was neutralized, the race was all together with only 20km to go. The decisive breakaway group of eight went clear on the race’s final climb, with only 10km to go to the line. Sunweb took up the chase, working for 2017 victor and US champion Coryn Rivera. In a field littered with contenders, CCC-Liv had the unique advantage of strength in depth, with Ashleigh Moolman-Pasio and Jeanne Korevaar in their ranks. Moolman-Pasio and Vos both made the break, and Moolman-Pasio kept the pace high to hold off the Sunweb chase and set up Vos for the final. “In the final climb we were with a small breakaway and there Ashleigh kept riding to get me into position for the sprint,” said Vos. The efforts of Moolman-Pasio kept the break a mere 10 seconds in front of the chasing peloton. A succession of attacks went from the breakaway group in the closing kilometers, with Uttrup Ludwig trying her hand several times. However the bunch came together for a final sprint, which Vos took with confidence.